Muzzy start. The day is half bright, half not. More rock where yesterday was snow. I am less hungover than certain others. Grumpiness and tired heads held at bay with slices of bread and butter. Discover that historic newspapers in the museum lounge have been SCRIBBLED on in biro. Outrageous. Multanovskiy arrives bringing Olle Carlsson books and big bags of life jackets/camping gear for another ship. Swift and happy visit. Frank light-headed, assess stock, munch lunch – more bread, cheese and salad. Rev up for speedy restock; it’s painless. Rick deals with some waste. We take new supplies down to boatshed. Do everything that needs doing. Thirty minutes before Nordnorge is due, whip open computer and write a few lines then hear the door bang – it’s Marco, and the staff are all buzzing round shop! Lots of single dollar note transactions and mayhem at a steady pace. Three hundred passengers. Try to start franking, but if we’d like to go over to the ship for dinner, the last ten der is leaving now. Lovely to be onboard our familiar friend. The Rockhopper crew travelled down on the Nordnorge, and had fun filming en route. We sit together and discuss angles, histories, contexts. I’m dying to make a phone call – kind receptionist lends me a spare cabin – don’t get through the first time, then cut off on the second try. Hey but it’s good to talk, half way round the world. Back with Joe and Victoria, and all their camera kit etc. to our wee hut. Lots of Nordnorge post, which needs stamps sticking and franking. Helen cashes up and restocks all by herself. Rick and Joe help carry boxes. Our guests are made cosy in the lounge, on Thermarests and yoga mats, with sleeping bags, hats and a hot water bottle. It’s going to be interesting with cameras in our faces; Joe says he wants to film us doing EVERYTHING! The shop’s ready for an early start. H reluctantly writes up yesterday’s base diary. 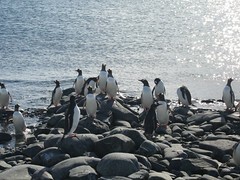 The penguins scattered on snow-covered island next to Bill’s look like an assortment of black commas.